We periodically watch videos from the internet on our TV. I found a cool piece of software that is getting a lot of attention – Boxee. It’s pretty slick, though not without it’s bugs (it is beta software and free, though, so I can’t complain). In the spirit of true American laziness, once I realized Boxee would work on our computer connected to our TV I decided I wanted to try a remote to control Boxee. 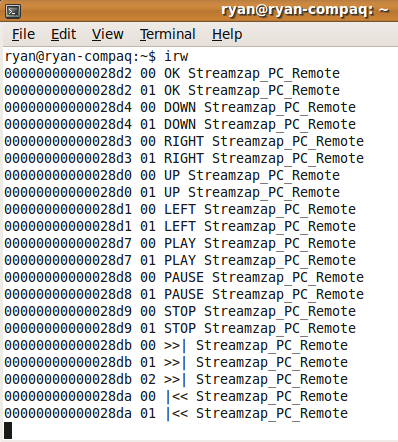 I found a remote that says it works with Linux – the Streamzap PC Remote. I ordered it from Amazon.com and once it arrived I faced the next issue: getting it to work with Linux. The Streamzap ships with software for Windows, but no software for Linux. Like most of Linux, support for the hardware is mostly built in or provided via open-source software packages. It isn’t the easiest thing in the world to set it up, so I’ve documented here how to do it so I have a future reference and for others (based on these instructions). First, install the “lirc” package using the Synaptic Package Manager (or “sudo apt-get install lirc” in the terminal). Once the install is complete, a window will pop up asking for the remote and some additional information. Fill everything out, selecting the Streamzap PC Remote. Now, you need to tell LIRC which buttons should do what in which programs. You can use a program to help generate the requisite scripts. Install “mythbuntu-lirc-generator” from the Synaptic Package Manager (or “sudo apt-get install mythbuntu-lirc-generator” in the terminal). You can modify these for the Streamzap Remote Control. I modified one, totem, to give it added functionality. My version is included in the zip file linked to below. If you want to just use my files, here they are.